Welcome to my blog. 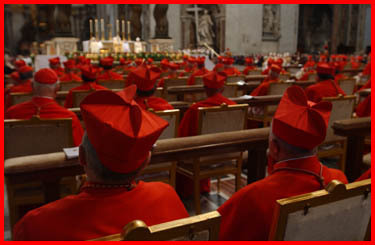 I spent most of the week in Rome, attending the Consistory in which Pope Benedict XVI created 23 new cardinals. 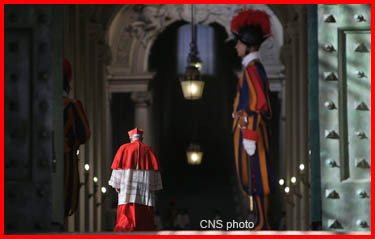 It certainly brought me memories of the last consistory when I was made cardinal. Recently, the pastors in Dorchester and Mattapan have been meeting to finalize a plan to revitalize schools in that neighborhood. It is the second project of the 2010 Initiative. The pastors as well as principals and parents have had many meetings over the year. People from the Catholic School Office, from the 2010 Initiative and Father Thomas Foley, pastor of St. Ann Parish in Dorchester, have been very good at bringing people together to talk and plan. When all is said and done, there will be fewer buildings used, and it will be considered one school with a number of different sites. It will be administered as one with a board of trustees who will have a special role in maintaining the Catholic identity of the institution, marketing Catholic education and working for development. Dorchester and Mattapan are neighborhoods where there are many school children, and the presence of Catholic education is very, very important there. We have many immigrant children in our schools. We want to provide these school children with refurbished schools, perhaps some new school buildings, and we want to improve both the salaries of teachers there and the curriculum. We hope to have better schools and more students. The 2010 Initiative began its work in Brockton where three schools were folded into one with two campuses. Both of those campuses were entirely refurbished, and an extension was put on one of them. The curriculums were updated, and much time and study went into how to make those schools better. As a result, instead of having three failing schools that would have closed in the very near future, we have one school with more students than we had in the three schools before. Trinity Catholic Academy will probably end up with a waiting list next year. This is a very encouraging sign for us at a time when Catholic education has suffered recent setbacks, particularly the primary schools. In general, the high schools in the United States are doing better than the primary schools. I think the primary schools are very important and need to be strengthened. It is very gratifying that so many people have come forward to help with the Catholic schools and have pledged financial aid because our school system needs a big investment if it is going to once again flourish and to give the quality education we all expect in Catholic schools. We are very, very grateful to those who have been working on the strategic committee — Jack Connors, Kathleen Driscoll, John Fish, Kim Steimle and all of those who have supported the efforts of 2010 that has resulted in such a wonderful success in Brockton. We presume that we will have the same success now in Dorchester and Mattapan. Our Catholic people, who themselves are beneficiaries of Catholic education, are coming forward to help us in this initiative. In the blog recently, we showed the fundraising dinner for Cathedral High School in the South End, which was basically organized by the alumni of the school. They raised $1.3 million at one dinner for one high school where many children who would not have the opportunity for this kind of education are going to graduate from high school, go on to college and find many opportunities in life. At the same time they will have an opportunity to hear about God, to learn the values of the Gospel and to learn how to pray. 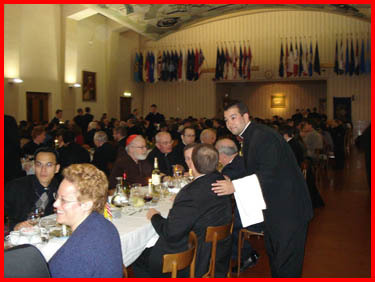 During Thanksgiving week, I was in Rome for the consistory and had a Thanksgiving feast at the North American College. 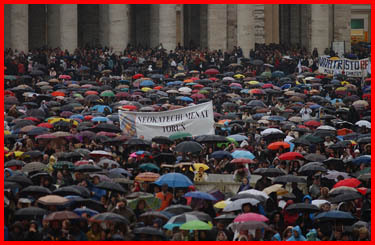 Each year the school invites Americans in Rome to participate. This year, there were several hundred guests at the dinner, and they sat us at tables by region. I was with the New England group that included some seminarians and priests from Massachusetts. From left to right: Rev Mr Mark Glover, Diocese of Springfield (4th Theology); Riley Williams (1st Theology), Rev Mr Ronnie Floyd (4h Theology), Fr Jay Mello (5h Theology) – all from the Diocese of Fall River; Rev Mr Jonathan Reardon (4h Theology) of the Diocese of Springfield, Nicholas Desimone (2nd Theology) of the Diocese of Worcester, and Fr Marcel Bouchard (Sabbatical Program) of the Diocese of Fall River. The dinner was a typical Thanksgiving meal — with the addition of a pasta course. They served us turkey, stuffing, cranberry sauce and pumpkin pie. There was also some entertainment put on by the seminarians. In addition to the North Americans there, they had a number of Australian seminarians, and one of them did an Elvis impersonation as they brought the pumpkin pies into the room. Everyone had a lovely evening. It is hard to be away from home at Thanksgiving, yet being with all these American expatriates in Rome made it easier. 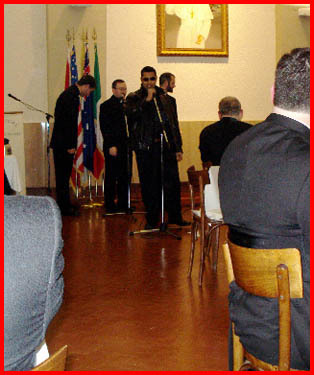 That same evening, we also went to a reception at the Vatican embassy in honor of Cardinal John Foley and Cardinal Daniel DiNardo the two new American cardinals. It is our ardent hope that Marianne Glendon will soon be serving as the United States’ ambassador to the Vatican. She certainly will be a stellar representative of our nation. Her knowledge of the Church and the international situation, I believe, will not only make her a very helpful to the Holy See, but will make her an invaluable representative for the United States. The Vatican post is certainly an important listening post. Very often in some of the most serious trouble spots, the Church is very present. 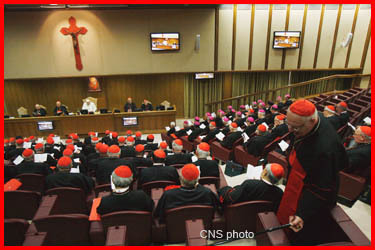 Friday, all of the cardinals, including the cardinals designate, were invited to a meeting with the Holy Father at the synod hall, where we gathered for the whole day. The morning began with Morning Prayer in Latin, and then the Holy Father made some introductory remarks. A presentation was given by Cardinal Walter Kasper president of the Pontifical Council for Promoting Christian Unity, on the situation of ecumenism in the Church at this time. He talked about some of the things that happened at the Oct. 8-14 plenary assembly for Catholic-Orthodox Dialogue in Ravenna, Italy. He also spoke about our relationship with the historical protestant reformation churches and evangelicals. Afterwards there was opportunity for exchanges on this topic, and that went on all morning. Then in the afternoon, we reassembled with the Holy Father to pray vespers and to talk about the situation of the Church in the world. 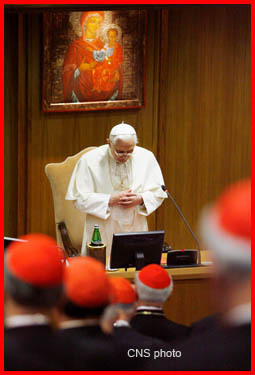 The Holy Father ended the evening session with his own personal reflections. It was a wonderful opportunity to be with the other cardinals and with the Holy Father. 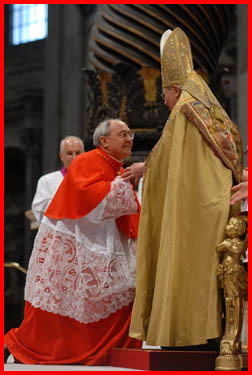 He did this before the last consistory, and it is an opportunity for the cardinals to get to know each other and to have time with the Holy Father. That was a very important part of the weekend. The next day, because there were reports that it was going to rain, they decided to have the ceremonies in the St. Peter’s Basilica. 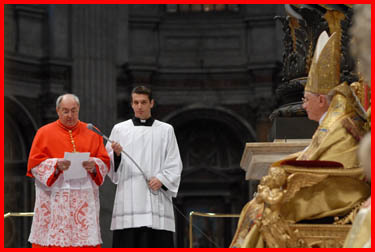 As part of the ceremony, new Cardinal Leonardo Sandri made an intervention on behalf of the cardinals, greeting the Holy Father. I was very impressed by that, and I would like to share some of those thoughts with you on the blog today. The color red makes reference to the Cross of Christ! 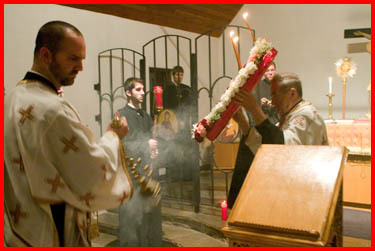 By bestowing upon us the Cardinal’s biretta, you will, Holy Father, exhort us to “be willing to conduct ourselves with the strength usque ad sanguinis effusionem (to the point of shedding blood) for the growth of the Christian faith, for the peace and tranquility of the People of God and for the liberty and spreading of the Holy Roman Church.” In spite of the many joys and consolations that we receive each day from the life of the People of God, we realize, however, that martyrdom, persecution, tribulation and scorn for the name of the Lord Jesus and for the fidelity to the Church and to the Pope are not absent. But we always feel intimately comforted and encouraged by the promise of the Lord: “Behold, I am with you everyday, even until the end of the world.” (Mt. 28, 20). It is this very divine Word that upholds the suffering witness of the sons and daughters of the Christian East, beginning with all those who live in the Land where our Redeemer was born. Your Holiness has called us to enter into the Clergy of the beloved Church of Rome, numbering us among your closest advisors and cooperators. And we want to assure you of the most faithful and loyal collaboration. We are and we will be by your side, Holy Father, in the most demanding moments as well as in the most ordinary of your Petrine ministry. We wish to be with the Pope, be it when he is being the servant of the truth and proclaims the primacy of God, or when he guides the Church in the renewal that flows from fidelity to the tradition; be it when he invokes peace by pointing to the great power of prayer and dialogue, or when he promotes the unity among Christians and the respect among all religions and cultures in the mutual exclusion of all sorts of violence. 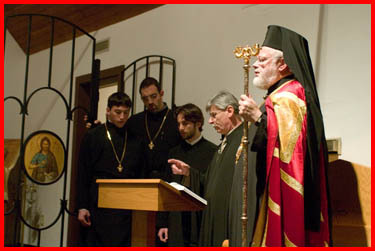 We wish to serve with you, Holy Father, the cause of Man: we are ready to follow you in the reaffirmation that the person without God loses himself; when, making yourself the true defensor hominis (defender of Man), You teach that marriage and family are the original cell of society, that life ought to be defended from the first moment to the end of its natural fulfillment, that the fundamental rights of each person, and particularly religious freedom, ought to be asserted and respected; when you defend the dignity of the human person in front of all oppressions. Yes, we are with the Pope when, in the sweet name of Jesus, he makes himself the advocate for children and young people as well as of the old-aged, of the poor and of the needy, of the unemployed, of the refugees and the migrants. May Christ the Good Shepherd, King of the Universe and history, confirm you with great effusions of His Holy Spirit, that You may be for the Church and for the World a sign of the love of God, who is the Father of all. May the Lord bless and guard Your Holiness and keep you as the joyful worker in His Vineyard. Thank you, Holy Father! 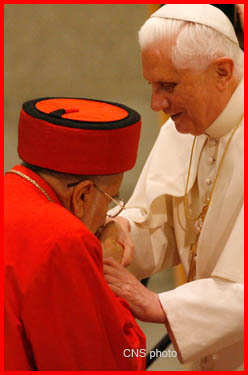 Among the cardinals who are over 80, was Cardinal Emmanuel III Delly, the Chaldean patriarch of Baghdad. His presence generated a lot of excitement in Rome. I did have the opportunity to greet him personally and to assure him of our prayers for his people. Already about one million Chaldean Catholics are refugees who have left Iraq. It is a tragedy. They had been there for 2,000 years. By naming Cardinal Delly, the Holy Father certainly wanted to indicate his desire to be present to the people of Iraq in these very difficult times. Another one of the senior cardinals was an old friend of mine, Cardinal Estanislao Karlic, archbishop emeritus of Parana, Argentina. He had visited me in Fall River, and I had stayed with him during the Congreso Misionero — or mission conference — that took place in his diocese in 1999, when I was still bishop in Fall River. He has been a great light in the Latin American church, and I was very pleased that the Holy Father singled him out. There was also a Jesuit, Cardinal Urbano Navarrete, former rector of Rome’s Pontifical Gregorian University, and a Franciscan friar, Cardinal Umberto Betti, former rector of Rome’s Pontifical Lateran University. 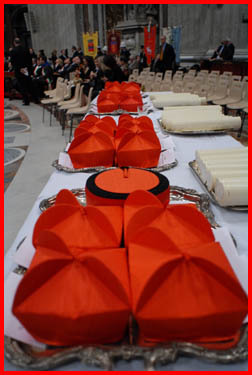 Cardinal Betti was in a wheel chair most of the time, though he was able to walk up to receive the red hat. It was a very beautiful ceremony, and the Holy Father’s words were very profound. Here is an excerpt of his homily. The Evangelist Mark reminds us, dear and venerable brothers, that every true disciple of Christ can aspire for one thing only: to share in his passion without claiming recompense. The Christian is called to assume the condition of “servant,” following in the footsteps of Jesus, spending his life for others in a gratuitous and disinterested way. It is not the quest for power and success but the humble gift of self for the good of the Church that should characterize each gesture and each word of ours. True Christian greatness, in fact, does not consist in dominating but in serving. Today Jesus repeats to each of us that he “did not come to be served but to serve and to give his life for the many” (Mark 10:45). This is the ideal that must orient your service. 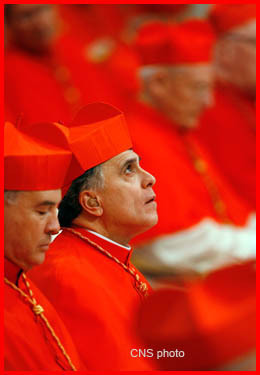 Dear brothers, in entering the College of Cardinals, the Lord asks of you and gives to you the service of love: love for God, love for his Church, love for our brothers, with a total and unconditional dedication, “usque ad sanguinis effusionem” [even to the shedding of blood], as is said in the formula for the imposition of the biretta and as is shown in the garments that you will put on. Be apostles of God, who is love, and witnesses of evangelical hope: The Christian people expects this of you. 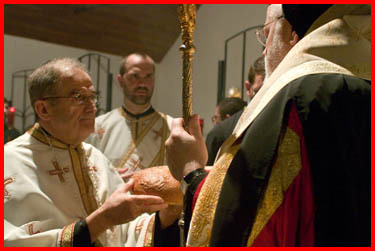 Today’s ceremony highlights the great responsibility that weighs on each of you, venerable and dear brothers, and which finds confirmation in the words of the Apostle Peter that we have just heard: “Adore the Lord, Christ, in your hearts, always ready to answer whoever asks you the reason for the hope that is in you” (1 Peter 3:15). Such a responsibility does not exempt you from risks, rather, as St. Peter adds, “It is better, if God wills it, to suffer for doing the good than for doing evil” (1 Peter 3:17). Christ asks you to confess his truth before men, to embrace and share his cause; and to accomplish all of this “with sweetness and respect, with a good conscience” (1 Peter 3:1-16), that is, with that interior humility that is a fruit of cooperation with the grace of God. 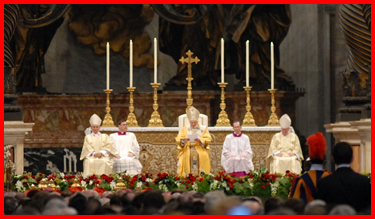 The next day, Sunday, was the Mass where the Holy Father gave the rings to each of the new cardinals, and it was the Feast of Christ the King, a very beautiful feast on which to celebrate this part of the consistory. 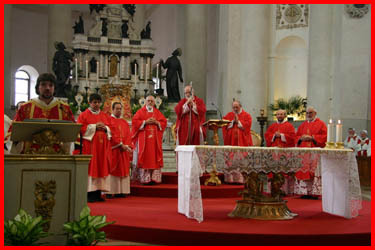 There was a lot of comment because on the altar during the Mass there were two cardinal deacons in dalmatics with miters, and none of us had ever seen that before. 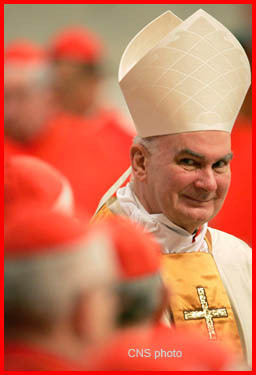 One of them was Cardinal James Stafford and the other Cardinal Dario Castrillon Hoyos. 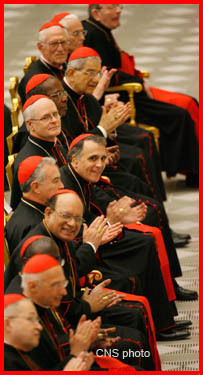 It was interesting to sort of emphasize the role of cardinal deacons in that way. 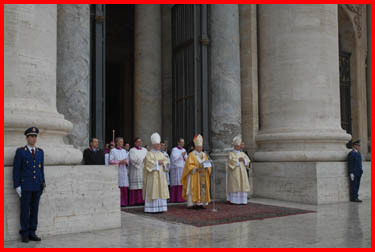 The Holy Father gave a magnificent homily at the Mass, and after the communion prayer, he walked to the doors of the basilica to pray the angelus and to give the final blessing to the throngs of people who were in the piazza because there was not enough room in the church. 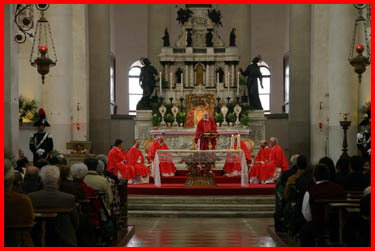 After the Mass the cardinals were invited to a lunch with the Holy Father, which was held in the vestibule of the audience hall. The meal concluded with a fruit strudel, which I am sure was the Holy Father’s favorite. I returned to the United States on Tuesday but before that I visited the Carmelitas de la Caridad de Vedruna — Carmelite Sisters of Charity of Vedruna — to thank them for honoring me with a “carta de hermandad.” The sent me a very nice letter granting me that honor, welcoming me as a “beloved brother” in their religious congregation. I worked with these sisters for much of my 20 years in Washington, DC. We worked very closely at the Centro Catolico, and there they ran a shelter for homeless women that did wonderful work. 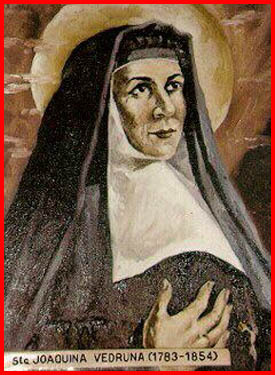 The foundress of their order was Santa Joaquina de Vedruna, and a capuchin Franciscan from Barcelona, Father Esteban de Olot, helped her write the rule. 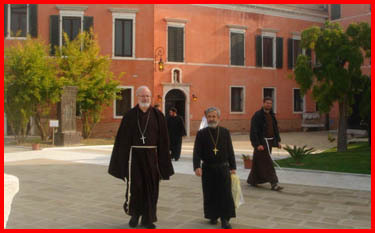 In a recent trip to Italy I was invited to give a talk for the Capuchins at the Capuchin Theological School in the Laurentianum in Venice. I also celebrated Mass for the opening of their School year in the Church of Il Redentore which is one of the most beautiful churches the Capuching Friars take care of. This is the text of my talk. 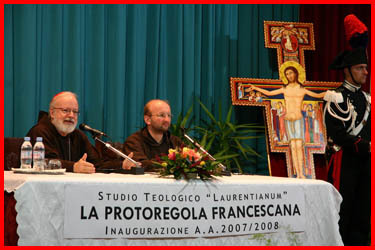 Reflections on the Constitutions in light of the 8th Centenary of the Proto-rule of St. Francis. As a child I began to serve Mass as an altar boy when I was six years old. My brother Ted was eight and had made his first communion so he taught me the Latin and how to mumble the Suscipiat. We lived so close to the parish Church, and in those days they always used acolytes at Mass so we served very often, especially the early Masses. It was then I met my first Capuchin. His name was Father Camillus, and he was a Don Camilo. He was very cheerful, a plump little friar. 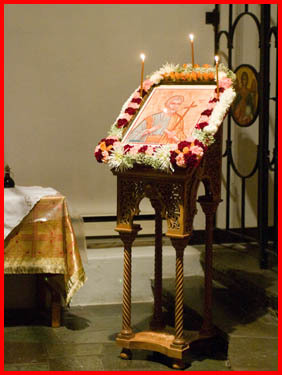 His bare feet fascinated me, and best of all he celebrated the Mass in fifteen minutes. Since we were fasting even from water, I really appreciated his speed so that I could get my breakfast. A few years later my brother was going on a retreat at the Capuchin Seminary so my Dad took me along for the ride. I was still too young for the retreat. When we arrived we met an old German friar in a tattered habit who was working in the garden. We stopped and talked to him for a long time. On the way home my Dad said: “That friar is the happiest man in the world.” I knew that what my father said was true. The friar did not have a beautiful wife, nice clothes or a big car but he was filled with peace and goodness. I thought to myself I would like to be happy like that friar. Years later I joined the community there, and the same friar, Father Bede, became my confessor. As a young friar I longed to go to the missions, and I was thrilled when I was ordained a deacon the Father General asked that I be sent to Easter Island in the middle of the Pacific Ocean. I was going to work with a German friar, Father Sebastian, who had been working with the Indians there for forty years. I began studying Rapanui, but before I left for the missions the Archbishop of Washington appealed to my Provincial for Spanish speaking friars who could work with the thousands of undocumented refugees fleeing the wars in Central America, from El Salvador, Guatemala, Nicaragua. My assignment was changed from Easter Island to the Lent of the illegal aliens. I was allowed to live among the poor in a building where the Centro Catolico Hispano was located. There was seldom heat or hot water and the cockroaches were the size of rats, and the rats were the size of cats. There were often gunfights in the building so one day I gathered all the tenants in the lobby for a “disarmament summit”. I put a table in the center of the room and asked everyone to hand over their guns. One old grandmother wearing a little bonnet opened her purse and produced a huge pistol. She waved it under my nose and said: “You are a priest, no one is going to do anything to you; me, I am keeping my gun”. Needless to say, I did not collect any guns that day. 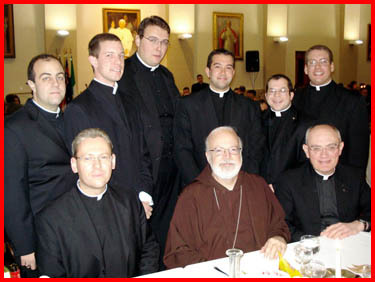 Working with the poor and with my brother Capuchins was a joy. I was the happiest man in the world. One day God said — look at Father Sean. He is too happy. Let’s make him a Bishop. 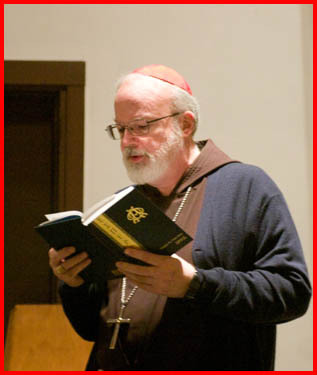 When I was told — I said: “I should have studied harder in the seminary.” I have been a friar for 42 years. I should be much holier after so many years of religious life. I am still a construction site. The joy of my life has always been my vocation as a Capuchin. My reflections today are not those of an expert, but those of a lover. I love Francis, his ideal, his way of life, his rule. I love the Capuchin Order more than my life. I feel so privileged to be a part of this family, and my only desire is that we be better sons of St. Francis. The more we love the same things, the more we do the same things, the more we live the same ideals the deeper our fraternity and the more powerful our witness of poverty, prayer and charity. And so I share these rather disorganized musings with you with the hope that I might be contributing something positive to the conversations about our Capuchin Constitutions. Be patient with me. How the world has changed. 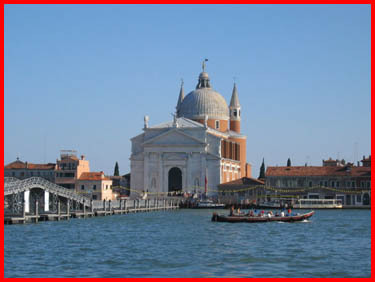 When I was a seminarian, at the beginning of the 1960’s, I went to Europe. In those days, it was clear from the first glance what country a person came from by looking at their clothes, their shoes, and their haircut. Forty years later, everyone dresses the same. We call this phenomenon globalization. I am sure it has its advantages and its disadvantages, but it is a reality that has resulted in a smaller world, and it has leveled the peculiar aspects of individual culture and ethnic identity. As members of the Catholic family and followers of Saint Francis who is the universal brother, our vocation has an aspect of spiritual globalization. When our new Constitutions were written, there was a great emphasis on pluriformity. Having participated in the Chapters that have worked on the Constitutions, I understand the noble motivations of the leaders. Still, it has always concerned me, I feared that we might be introducing the Trojan Horse into the City of God and so might allow the radical nature of our life as Capuchins to be watered down. 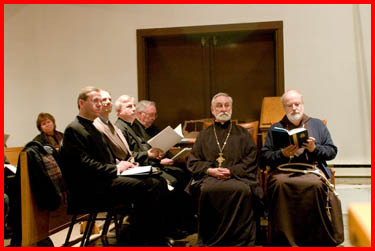 At Pentecost, our Father General wrote a letter entitled, “Circular Letter to all the Friars of the Order concerning our Constitutions.” For me it is very significant that Fra Mauro had chosen the Feast of Pentecost to address us. Saint Francis desired that our Chapters be on the Feast of Pentecost so that the Holy Spirit would be with our Father General. In his beautiful letter, Fra Mauro opens with the words of Saint Francis: “Great things we have promised to God, but greater things has God promised to us!” He announces that the Order will review our Constitutions, a task that will culminate in an Extraordinary Chapter in 2010. He invites all of us to participate in this project and therefore, I have decided to respond to this invitation. I am not a great theologian, I am not nor have I ever been a Provincial, nor a definitor, and not even a Guardian . When I was named Bishop, one of the friars was heard to say, “The stone rejected by the builders has become the cornerstone.” My sole credential for formulating these reflections is that I love the Capuchin Order more than my own life. We are approaching the Jubilee of 2009 that will mark the 8th centenary of the approval of the first Rule, the propositum vitae, “revelation of the Almighty” to Brother Francis and that the Holy Father confirmed in 1209. The Father General encourages us to use this opportunity to commit ourselves anew to live the Rule that Pope Honorius definitively approved in 1223, and to live it according to the Constitutions. For us Capuchins, the Constitutions are always conceived as a way to follow more faithfully the general inspiration that is the life and the Rule of Saint Francis. A profound desire to return to the original inspiration of Saint Francis, of observing the Rule without exceptions, animated our first Capuchin brothers. For them, the Testament was the first spiritual commentary on the Rule and a source of profound inspiration for the life of Capuchins. Our Minister General is giving us a magnificent opportunity to rededicate ourselves to our way of life turning yet another time to our Constitutions, praying and reflecting over their meaning and asking the Almighty to guide us in the way of the Gospel of the life as Capuchin Friars Minor. I am happy that the Father General is associating our efforts to improve the Constitutions with the Jubilee of 2009, uniting this exercise with the original proposal of Saint Francis for our life. In that simple list of injunctions taken from the Gospel, our founder delineates clearly the fundamental values of our fraternity. A detailed legislation was not necessary, but only a radical dedication to a few precise principles that orients the entire life and activity of each friar and of the entire community. For me the great historical figure that has contributed in great measure to our way of living the Capuchin charism of following in the footsteps of St. Francis, is Fra Bernardino d’Asti. He has been called the third founder of the Capuchins. It is a shame that he has never been canonized; he was clearly such a holy friar and a real instrument of God in the codifying and organizing of the Capuchin Reform! He was the fundamental author of the Constitutions of 1535, a masterpiece of Capuchin spirituality. It is said that a camel is a horse constructed by a committee. This is my only concern about us 12,000 Capuchins that are helping Fra Mauro revise the Constitutions. The Rule, the Testament and the original Constitutions were not the work of a large committee, but rather of the Holy Spirit. Saint Francis could not be clearer about the Rule and the authorship of our way of life. “No one showed me what I had to do, but the Most High Himself revealed to me that I should live according to the Pattern of the Holy Gospel. I had this written down simply and in few words and the Lord Pope confirmed it for me” (the Testament #14, 15). Saint Francis was a gentle person, in art he is portrayed surrounded by birds and Zappelli gave us a Saint Francis who was so sweet. But in reality he was a lion when it came to defending the Rule. Honorius at the end of rule warns us that anyone who tampers with the rule or rashly dares to oppose it shall incur the anger of God and of His Blessed Apostles Peter and Paul. I am much more worried about the wrath of Saint Francis if we water down the Rule or produce constitutions that are bland and innocuous. The Rule of Saint Francis is very short but very powerful. When Bernardino d’Asti wrote our first constitutions, I believe he was very inspired by the Holy Spirit and an unwavering commitment to the Rule and Life that Francis wanted to pass on to us as a gift from God. A sense of the enormous responsibility that weighed upon him and those first Capuchin friars. They felt they would have to answer to God and to Saint Francis. Those first constitutions declare that the purpose of the document was to be a fence for our Holy Rule, in order that like the unconquerable tower of David, it might have a means of protection from whatever might injure the spirit of our Lord Jesus Christ, and keep out all relaxations opposed to the fervent and seraphic zeal bequeathed to us by our Father Saint Francis. In the first chapter the constitutions of 1536 it says that our life is the observance of the Gospel and that the Rule is simply the Incarnation of the Gospel. In this same chapter it is stipulated that the four Gospels be read three times a year, i.e., one Gospel every month. The second paragraph ordains that the Rule be read in each friary every Friday. Bernardino wisely points us to the Gospels and the Rule as the primary sources of our way of life. Bernardino of Asti stated that three virtues were essential to the Capuchin way of Life: “Charity, Poverty and Prayer”. First and foremost is love but “charity cannot survive in us without prayer and poverty.” These three virtues, he added “witness one to the other.” Hence, there can be no real poverty where charity and prayer are missing. There can be no real prayer without charity and poverty, neither is there real love where there is not prayer or poverty (Litterae circulares 1548). The Rule, the Testament and the early constitutions challenge us to live these Capuchin virtues in a radical way. We are to live them as individuals but also as a community. The Constitutions of 1536 describe Capuchin poverty as a life of a fraternity committed to complete poverty, courting insecurity, rejecting any stable source of income. The Capuchin idea of poverty is not that of monastic poverty as practiced by the first Christians who possessed all things in common, but apostolic poverty as practiced by Christ and the Apostles. The sixth chapter portrays that sense of pilgrimage that betokens Francis’ words about living as pilgrims and strangers. 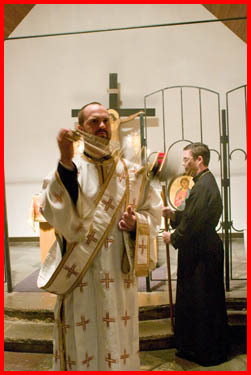 The constitutions say: “Let every friar remember that evangelical poverty consists in the firm resolution of not becoming attached to any earthly thing, of using the things of the world most sparingly as if compelled by necessity, and for the glory of God whom we are to recognize as the true owner of all things. Whatever is over and above our own needs, they shall for the honor of poverty, give it to the poor. We should always remember that we dwell in an Inn and eat the sins of the people” (#67). That spirit of being a pilgrim is even more radical in the first Capuchin Statues of Albacina where the friars were to dwell in huts made of mud and sticks. The cells were to be so humble and narrow that they would be like graves for the living or a prison for penitents. Not surprisingly, such a radical policy was changed by the 1552 revision of the Constitutions. Still the old legislation speaks to us about the need to be a pilgrim and stranger in this world. The friars of the Primitive Observance in my diocese are following the old practice but since they are few and have only four small houses, it is still doable. The radical love and self-giving that characterize our Capuchin vocation is beautifully embodied in Benardinos’ 1536 constitutions where reference is made to the care of plague victims by the friars. No 89 states: “And since they who are detached from this world find it sweet, just and charitable to die for the love of Him Who died for us on the cross, we ordain that during a plague the Friars shall succor the afflicted …”. This article calling for heroic charity was omitted in latter editions of the Constitutions; nevertheless, the friars continued to sacrifice their lives to serve plague victims throughout our history. When the plague decimated the Venetian Republic in 1575 and 1576 the Capuchins performed heroic feats of charity. And when Milan was perishing in the plague in 1576, Saint Charles Borromeo asked the Capuchins to intervene. The friars labored cheerfully for two years. This was likewise the case in France, Germany, Spain and the low countries where many Capuchins died as martyrs of charity, providing for the bodily and spiritual needs of the sick. The chronicler, Marcellino of Pisa, wrote in 1676: “Future generations should know what a large number of friars bravely risked their lives in the service of the sick. As elephants are spurred on to battle at the sight of blood, it will suffice for future Capuchins to see these valiant warriors in the difficult and revolting arena of the plague fighting bravely and winning an eternal crown of glory.” In 1720 the Bishop of Marseilles recounted how forty-two friars died and many others fell sick attending to the spiritual and physical needs of the plague victims in his city. He writes: “Not one Capuchin abandoned the city. There was not one who did not throw himself wholeheartedly into the work, not one who did not labor with complete disregard for his own safety to the very end” (correspondence de Msr.de Belsunce eveque de Marseille). I have not seen the recommendations for the new constitutions. I am told that there is a desire to introduce more Peace and Justice and Ecology into the Constitutions. I believe the Capuchins should be very much embodied in promoting the social Gospel of the Church. I would like to express two caveats. First of all there is the danger of a false sense of security. In other words by talking a lot about the social justice themes we might think that we are living a radical form of the Gospel Life. I see many religious communities in my country produce documents worthy of the Green Party, but they are dying on the vine themselves. Was it Saint Francis who said the saints did all the work and we get the credit by talking about them? Francis reformed the Church and society by living the Gospel Life in a radical way. He did not criticize the hierarchy, the nobilities, and the corrupt leaders. He lived a life of intense prayer, poverty and love — and it was like a bomb dropped on the world. His idea of brotherhood led to a Christian pacifism in the secular Franciscans that brought many wars to a halt. He even held out an olive branch to Islam at a time when our ancestors where planting the seeds of an ageless enmity that is blossoming in terrorism today. The second caveat is not mine, but rather comes from someone intelligent, a wonderful theologian who has been consulted on the recommended texts of the new constitutions. He sees a subtle plagiarism in the challenge of fixing everything that is broken in our world. The present constitutions emerged from a long process and the hard work of commissions and General Chapters. We also had the advantage of the newly composed Constitutions of the OFMs and the scholarly work of the legendary Father Cajetan Esser, O.F.M. Each Chapter of the present Capuchin Constitutions adopted a format which takes the Revelation of the Church and then Francis’ genius and then our fraternity and then develops the topic of the Chapter. It is a wonderfully constructed ecclesial vision of religious life and Franciscan spirituality. It locates us in the context of the Church and not as a sideshow of charismatic wonder. 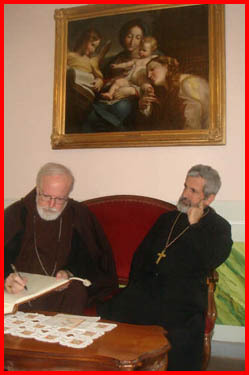 Capitular fathers were grateful to the fine work of the Italian Friar Guiseppe Santorelli from the Province of Ancora who helped incorporate more of the original Capuchin constitutions into the new Constitutions. All in all the Chapters that worked on the Constitutions did a remarkable job. I was present for some of those Chapters as a lowly translator and witnessed firsthand the hard work of the Capitulars. • The new Constitutions dropped too much of our life of penance and the contemplative side of our life. • The new Constitutions favor generalities to honor an ill-conceived notion of pluriformity that has robbed the Constitutions of its fire. • The new Constitutions needed to say more about the friars’ love for the Church and the fidelity to her moral and dogmatic teaching. 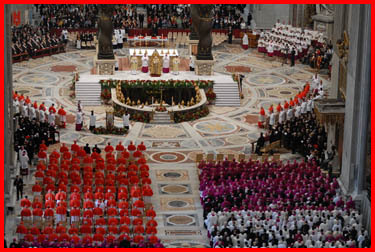 Francis was so devoted to the Church, despite all the defects and shortcomings of the clergy and leadership. •Our Constitutions should not be a bland description of how we are living our vocation in the 3rd millennium, but rather a description of how we should be living our life in a concrete program of radical poverty, radical prayer, radical love. Constitutions should not be easily tempered with. Performance and stability are important to inspire people with a sense of awe and seriousness. In today’s world young people see how everything is expendable, “throw-away.” Technology has created a world where everything is experimental or obsolete. The Constitutions are our identity as Capuchins and need to be firmly grounded in our history. We do not need a document that is modern and trendy that will soon seem dated and passe. Capuchin Identity is safeguarded by the Constitutions only in as much as it inspires us to live the Rule and Testament in a radical way. Generalities will never do. 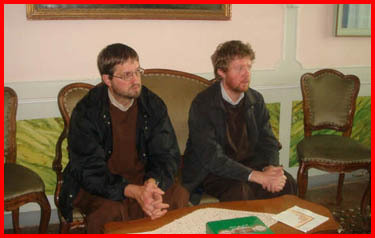 The Gospel Life of the Capuchin Brotherhood is about radical love. It is a life that begins with contemplative prayer. This allows one to imitate the self-emptying of Christ’s kenosis and leads to a radical witness that invites people to renounce the extreme individualism and materialism of our age in order to follow Christ poor and crucified. Some people are advocating removing some of the concrete directives on prayer that are in the Constitutions and place them in the Ordinances. This would be a fatal mistake. The ordinances are unknown and irrelevant to most of the friars. The Rule and Constitutions will always be the documents that form us and teach us our identity. The Constitutions cannot be a weak exhortation to live a vague ideal of the most common denominator. Rather, the Constitutions should be a challenging document that incorporates concrete directives about the life of prayer, poverty, and austerity. We need more boldness in our Constitutions if we are going to inspire young men to join our ranks. If we embrace or institutionalize a comfortable, bourgeois life style, the Order will die out, no matter how much lip service we give to a liberal social agenda. 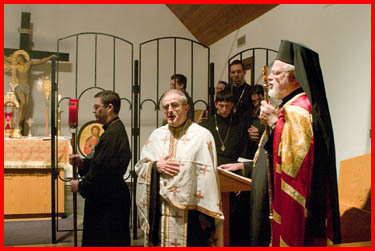 Our way of life lived in all its radical renunciation is capable of producing men whose witness of prayer, poverty and love will help transform society by calling people back to God, calling them to come home to the Church, by helping people to have a sense of personal vocation and to be part of a communal mission. It is my conviction that the contemplative aspects of our life should be addressed first of all. 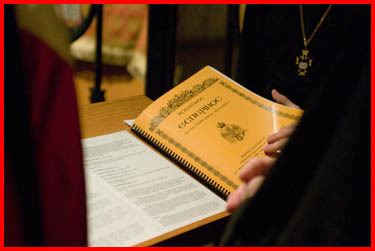 The Capuchin charism begins with the eremitical emphasis of the first friars as reflected in the document of Albacena, the subsequent Constitutions elaborate more on ministry and mission. The point of departure however is the contemplative basis of our vocation. When the life of prayer is carefully delineated, then the other aspects of our life take shape. The centrality of the Eucharist and mental prayer needs to be very clear. Daily celebration of a communal Eucharist, two periods of meditation, and the communal praying of the entire liturgy of the hours needs to be enshrined in the Constitutions as a bare minimum. To leave that up to local communities to legislate is too risky. By leaving things out of the Constitutions we are sending a signal that they are not really important and we encourage a take it or leave it attitude. The subjective mood, weak exhortations and mild recommendations do not communicate the sense of urgency that Francis wants to communicate in the Rule. It is a matter of life and death. St. Paul says no one will follow an uncertain trumpet blast. Our legislation should not be an exercise in subtleties. The directives about prayer and poverty need to be concrete, airtight and unyielding. In looking at our Constitutions over our history, one finds that our Constitutions are not legalistic documents with a lot of regulations. However, they are concrete enough to guarantee a unified identity of what it means to be a Capuchin. Preparing ourselves to celebrate the anniversary of the Rule of St. Francis, I pray so that our Capuchin Family commits itself anew to follow with decision and love our Seraphic Father, not a safe distance, but up close. May the work to which the Father General has called us reinforce our Constitutions and at the same time reinforce our decision to live our vocation of radical prayer, poverty and charity. While in Venice I also visited an Armenian Catholic monastery which is on the island of San Lazzaro, located in the Venice lagoon. 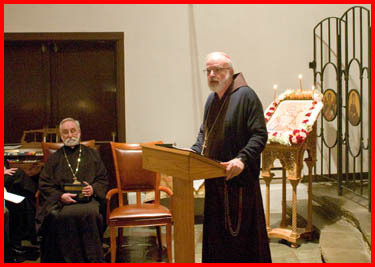 The abbot has also visited me here in Boston. 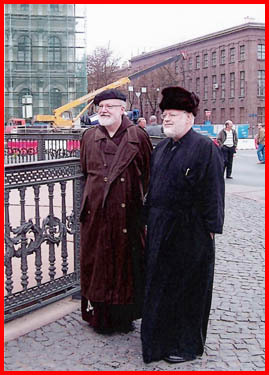 The Holy Father, since the time of Pope John Paul II, has exchanged representatives with the Ecumenical Patriarch in Constantinople for the feast of Andrew and Peter, the two brothers, Andrew representing the Eastern rite and Peter representing the Bishop of Rome. So in Boston for many years we have followed the same custom. 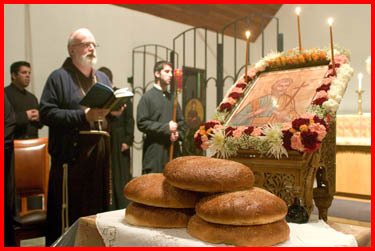 So accordingly I was with the Greek Orthodox community on Thursday evening as they celebrated the first vespers of the Feast of St.. Andrew. Many of the people who participated in the Joint Catholic- Orthodox pilgrimage to Rome, Constantinople and St. Petersburg were there. while I followed along in a book. Another priest joined in the chanting. 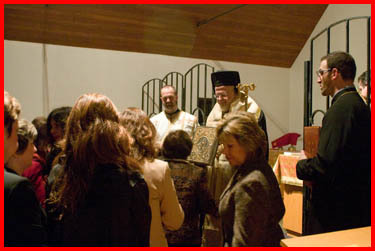 Women who gathered had the opportunity to receive a blessing. 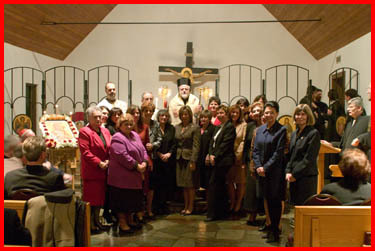 They are part of a nation-wide organization for Greek Orthodox women. I gave a short message to the crowd in which I told them I was still moved by the recent experience of the pilgrimage, particularly to have had the privilege of meeting the Ecumenical Patriarch and to pray solemn Vespers with him. My own confidence in the possibility of unity during our lifetime has been strengthened by my experience of the pilgrimage and my friendship with Metropolitan Methodius and so many brothers and sisters in the Orthodox Church. 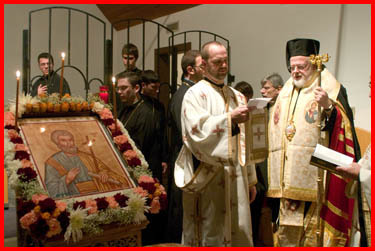 speak of our desire for unity between the Catholic and Orthodox Churches. spoke of our hope that unity would come soon. 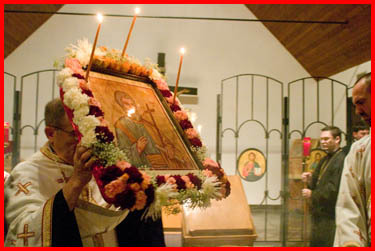 In that document, the Orthodox have actually recognized the primacy of the Holy Father. There is still much to be done as far as to clarify what that means but that was a very important step towards unity. That they may all be one. As you, Father, are in me and I am in you, may they also be one in us so that the world may believe that you have sent me” (Jn 17, 21). 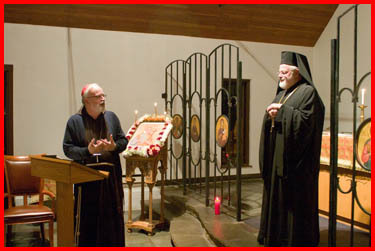 We give thanks to the triune God who has gathered us — members of the Joint International Commission for the Theological Dialogue between the Roman Catholic Church and the Orthodox Church — so that we might respond together in obedience to this prayer of Jesus. We are conscious that our dialogue is restarting in a world that has changed profoundly in recent times. The processes of secularization and globalization, and the challenge posed by new encounters between Christians and believers of other religions, require that the disciples of Christ give witness to their faith, love and hope with a new urgency. May the Spirit of the risen Lord empower our hearts and minds to bear the fruits of unity in the relationship between our Churches, so that together we may serve the unity and peace of the whole human family. May the same Spirit lead us to the full expression of the mystery of ecclesial communion, that we gratefully acknowledge as a wonderful gift of God to the world, a mystery whose beauty radiates especially in the holiness of the saints, to which all are called. For the photo of the week, I want to share with you a photo with the Metropolitan in St. Petersburg that a Greek-Orthodox pilgrim handed me at the Vespers.